I've never worked for a startup. Being freelance and owning your own tiny solopreneur business is for sure start-up-esque. But I've never worked for a start-up in the San Francisco tech industry way that a lot of my friends have with the endless hours, the all but non-existent work/life boundaries, and the sacrifice your soul for the stock-options mentality. But this week? Start-up mode. I confess I haven't showered in 5 days. I haven't been to the gym. I haven't even checked my mail. I wake up at 6, put on the exact same t-shirt I've worn for the past....lot of days, and work til, well, it's 11pm right now. The fact that I'm out of almond milk will finally force me out of the house tomorrow. I've been living off of cheese and crackers and last night in a last ditch scrounge effort I had rice and sriracha for dinner. All because I got this idea that I can't put down. Maybe you saw it on the way in. The workshops and my very first live webinar. Something shifted the past couple of months. A little bit of restlessness. A little bit what felt like directionless-ness. I tried to think about the reasons behind why I do what I do. What I love about it and what I don't. What it satisfies and what it doesn't. For the longest time, on all counts, I've gotten to do my dream job. Then I started this little blog just as a side thing. Something to do with the days off here and there. And then I started to really love it. Taking a blog beyond a hobby is so much harder than I ever imagined. It must be similar to what aspiring actors in Hollywood feel like clamoring for a voice in an oversaturated market. What I have noticed is that people in this sphere are incredibly generous with their knowledge. Food styling is an industry where people are not (generous with their knowledge) and I realized that that's what's missing. I just want to help people do what they love. Because I know what it's like to do what you truly, truly love and don't believe that that's an experience reserved for a few. But I do believe people need encouraging. And help. I don't know the first thing about social media or marketing or tech or the bajillion other components that go in to running a successful online space. I'm not the best photographer (yet) by any means either. I can't help people with 90 percent of what it takes to get where they're going in this crazy blog world but I do know two things. The first is food styling and how to make food look pretty for the camera. The second is how to encourage. If someone's an aspiring food blogger like I am and food photography is their pain point, I certainly have knowledge to share. And I can't think of anything more fulfilling and fun than teaching what I know as a means to encourage and empower someone to keep moving forward. This Thanksgiving I'm in Orange County with my best friend's very Scottish family. I come from a family of nurses that generally work through the Thanksgiving holiday in order to have time off over Christmas. Last year I went home for what was ultimately my grandmother's last Thanksgiving. Because of that, I think we're all just fine to let the holiday pass this year without much fanfare. It's just not the same. So here I am. I flew in early this morning, still in pajamas. The moment I put my backpack down Gran promptly set to work making me eggs on toast with ham. When she set it before me I was taken back by how hard it was for me to receive such a seemingly simple act of hospitality. Although properly made over-easy eggs aren't as simple as they sound. Something inside of me was just so uneasy. Like when you're in an uncomfortable conversation and you don't know what to do with your hands. I felt like I needed to do something. Or apologize. Or get up and help. I suppose sometimes the best way serve someone is to let them serve. And so I did. And I felt my tired, city-fighting soul take a deep breath and unclench it's fists and just...receive. The combination of relief plus heartbreak over the (apparently widely unseen) day-to-day struggle of life plus just the simple kindness of the act was so much that I started to cry. Over someone making me eggs! Isn't that weird? And kind of sad? She gave me a hug and I vowed not to cry in my eggs every morning for the next 4 days. How do we (or maybe just I) let our lives, our hearts, our souls get to this point? For a moment, for a few days, it's unfamiliar territory to be cared for well. But it's so welcome. Last week I went with a few friends to see Anthony Bourdain live. He's touring for a new book release and at the end of the talk he left time for Q & A. Someone asked the question that I'm sure he gets asked at every show, "What's the best meal you've ever had?" I remember lots of things he said. But I'll never forget his answer to this. "Food is contextual," he said. "It's the time and place and the emotion and the people and the entire context of a meal that make it the best (or worst) of your life. Whatever it is that satisfies or comforts or calls to mind great memory. Whatever you need in that moment, that's your best meal." And this morning with the weight of everything, good, bad, beautiful, exciting, terrifying, exhausting, and inspiring that comes with pursuing a new thing, eggs on toast with ham was the best meal of my life. Next weekend, whatever Allison is making for Friday night dinner when I'm feeling worn out from the week will be the best meal of my life. Come the end of December, the best meal of my life will be the first taste of my mom's pumpkin cookies. She makes them every year, once a year. Isn't it wonderful to know that the best is forever yet to come? I was supposed to be on my way to Europe for 10 days starting tomorrow to experience the Christmas markets in Prague, Stockholm, and Copenhagen. It would have been epic, right? But I finished those eggs and thought, "Lord, this is exactly where I'm supposed to be right now. I needed this. And you knew I did. Thank you." 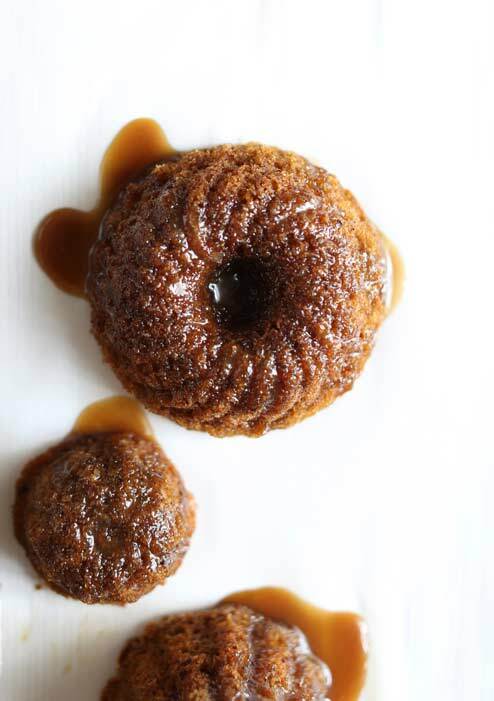 To the Scottish, sticky toffee pudding is a very big deal. 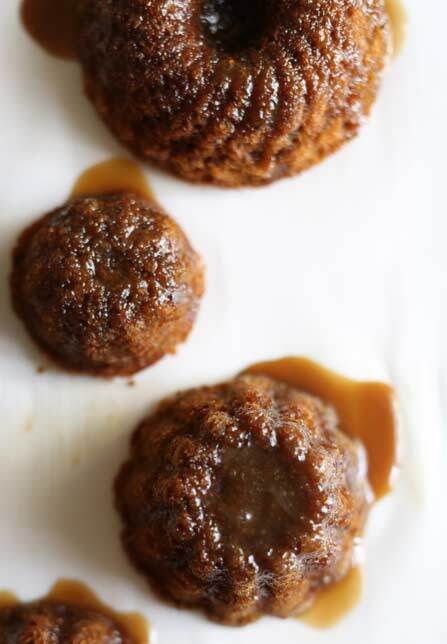 Hence these little date cakes which are a bit off the classic iteration, especially the gluten-free part, but this recipe is well worthy of the tradition. This recipe is a modified gluten-free version of the one found in the Gjelina Cookbook. Preheat the oven to 350 degrees. Butter and flour 16 mini bundt pans, 12 muffin tins, or a 9 inch square baking pan. This quantity will work for any of those. Place the dates in a medium-sized bowl. Put the baking soda into a two-cup measure and add the hot water. 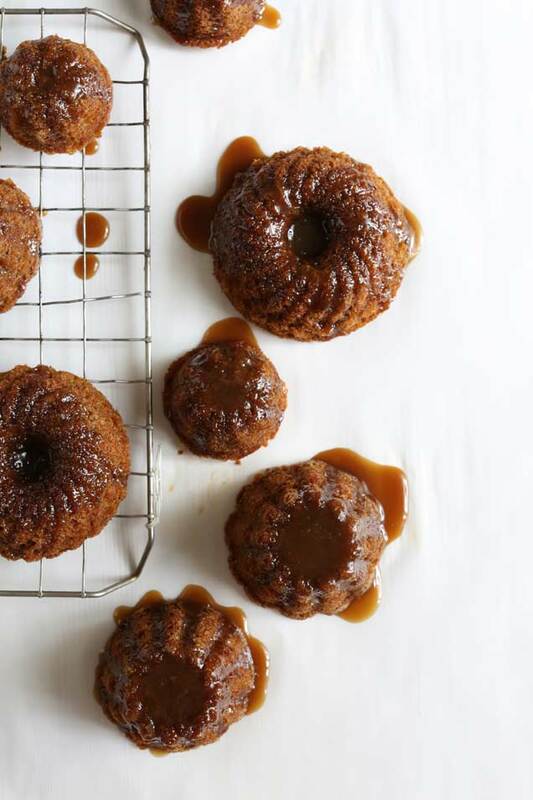 Pour the hot water over the dates and let stand for about 5 minutes until the dates begin to soften and then smush them with a fork or a potato masher until they're mostly dissolved. In another medium-sized bowl whisk together the flour blend, psyllium, and baking powder. In a large bowl whisk together the vanilla, sugar, egg, and yolk until pale and thick and it leaves a ribbon over the top when lifted with a spoon. Stir in the date mixture. Add the flour mixture and whisk until just combined. Portion or pour the batter into the prepared dish(es) filling to 3/4 full. Bake for 25-35 minutes depending on the pan you selected. Cool for 30 minutes in the pan before turning out onto a wire rack to cool completely. To make the sauce, melt the butter, molasses, and sugar in a saucepan over medium heat. Once the sugar is dissolved slowly whisk in the cream. When the cream is fully incorporated remove from the heat and stir in the bourbon and salt. 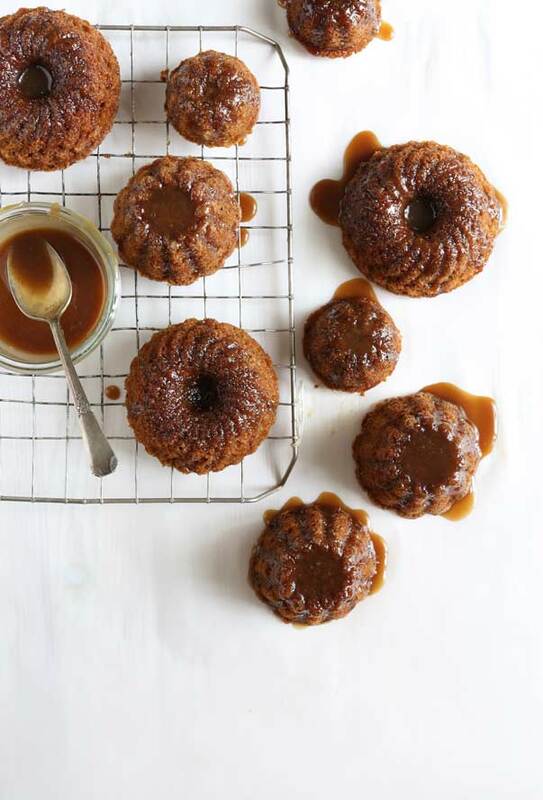 To serve, spoon the warm toffee sauce over the cakes. If you're using a 9 inch square or muffin-sized portions poke a few holes with a wooden skewer so the cake can soak up more of the sauce. 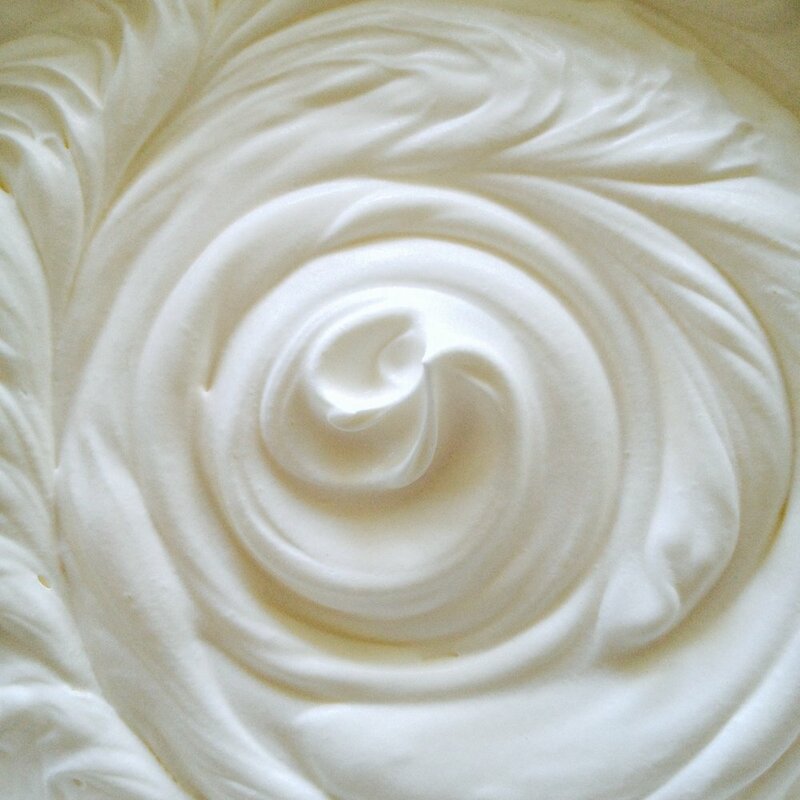 Top with sweetened whipped cream or vanilla ice cream.